Could we leverage Augmented Reality (AR) apps for Crisis Mapping? I’ve been thinking about this question for a while but finally decided to experiment after bumping into Autonomy here at the IPI World Congress in Taipei. The company has a free AR app called Aurasma, which basically lets the user create their own AR action. So I gave it a spin, figuring that if people could animate the odd T-Rex splish-splashing in the Bay Area, there might also be some humanitarian applications worth exploring. Autonomy’s AR app is available for the iPhone, iPad and the Android. What is especially neat is that you can cache the AR data and therefore use the app off-line, always a plus for crisis response. I experimented by using: (1) the amazing Humanitarian OpenStreetMap animated video of Haiti, (2) Internews’s excellent humanitarian technology report on Dadaab (a must read), and (3), a printout of WalkingPapers for some location in California. I had to use an iPhone and iPad at the same time to film the AR in action, so apologies in advance for the less than smooth panning. In this first video, I point the iPad’s camera to a screenshot print-out of the OpenStreetMap (OSM) video, the cover of Internews’s report and a paper-based map from WalkingPapers. For the OSM screenshot, I superimposed the video animation. I added a dynamic visualization of an Ushahidi platform for Somalia on the front page of the Internews report and added AR red dots to the WalkingPapers handout. 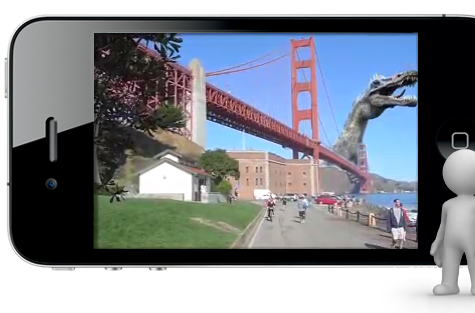 The OSM video animation in AR is a little wobbly but comes out much nicer on this video which demo’s the iPhone app. The Aurasma app was easy to use and the Autonomy Marketing Executive I spoke to said he’d be happy to support humanitarian applications of the platform. One idea would be to visualize MapAction GIS products in the field with an AR layer for crowdsourced data, for example. In other words, the hard copy maps could serve as informative base maps on top of which dynamic event-data could be visualized (and updated) via the Aurasma app. A related idea: visualize projected weather forecasts on top of a hard copy map of flood prone areas. Of course, the same types of visualizations could be done from a GIS platform but I’m thinking about mobile, rapid and off-line options for humanitarian professionals not conversant in GIS. How would you apply AR to crisis mapping? Is AR even useful for humanitarian response or yet another unnecessary gadget? Feel free to share your thoughts in the comments section below. (As for fans of David Suarez’s book, The Daemon, yes, this brings us one step closer to Matthew Sobol’s vision). This entry was posted in Crisis Mapping, Humanitarian Technologies and tagged AR, Augmented, Aurasma, Autonomy, Reality. Bookmark the permalink. As someone who’s spent the better part of the past few months working on AR technology, in my opinion, AR will become most useful once it becomes a passive experience connected to glasses, contacts or even our phisiology. Right now most AR remains a cumbersome, non-practical user experience which translates to non-adoption. Beyond that, in many ways reality is augmented already by the technology tools and platforms that already exist. With messages which are tied to location and visualizations which are tied to those messages, the only thing that’s missing is the ‘lens’ through which to actually view the real world with this data. nice, but what are the advantages of an augmented physical map over a completely virtual map (a-la-google-maps)? I’ve actually been exploring the merger of these technologies as well, and both previous comments are fairly accurate. The utility of AR is weighed down by its bulkiness, and within a crisis, the most important aspect to engaging information is speed and accuracy. I do however see room for growth in terms of planning for disasters etc., wherein visualizing information from multiple perspectives provides new opportunities for insight.